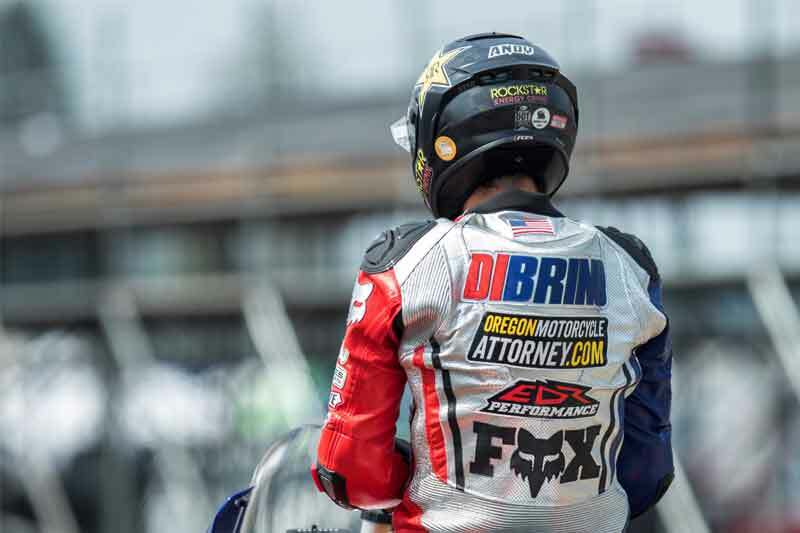 The other weekend I set the new fastest lap at Portland International Raceway during round 6 of the Oregon Motorcycle Road Racing Association series with a 1:05.228! My EDR Performance prepped Yamaha R1 backed by Oregon Motorcycle Attorney was working flawlessly. Here is how that special weekend went. Coming into the race weekend, OMRRA had a $1500 track record bounty up for grabs. The outright track record, as well as records for bikes based on size were up for grabs. If only one person broke a track record, they'd be awarded the full $1500. If two different people broke two different records, the money would be divided. All in all there were about 5 lap records on the table. Since I missed a race due to X Games, I was not in the hunt for the overall championship, and I had nothing to lose. It had been 4 years since I've been in the 1:05 lap time range. And I honestly wasn't sure if it was possible to beat the old record without some MotoAmerica competition coming into town, or my buddy and previous track record holder Devon McDonough coming out to race me. But I kept and open mind and decided to make some riding adjustments during Fridays practice hoping to find some extra speed. Saturday was looking to be the day it would all go down. My competitors and I were flying in practice, turning mid 1:06 second lap times early in the morning. That's always a sign of 1:05s, because normally we drop about a second off our lap times when racing. I felt really strong, the strongest I've felt in years actually. I was feeling confident for the races, and I had a strategy for breaking the track record. When Devon McDonough broke my record back in September of 2014, I was leading and he had a couple second gap to close in a race. Having me to hunt down helped him do his fast lap. I had never tried that before. Normally I start on pole and am racing for 1st the entire race, setting the pace with nobody in front. And if there is someone in front, we are battling. And when I am leading, I am usually defending against Ryan Sutton or someone else. So the plan was not to get a good start and fight for the lead right away. Instead, I would take it easy and allow the leaders to build a small gap for me to try to close. First race up Saturday was Formula Ultra. This race was the test to see if I really had what it took to break the lap record and see how my plan would play out. I purposely held back off the start and let Ryan Sutton, Jeremy Coffey, Kevin Pinkstaff and Brian Pinkstaff get away. On lap 2 I made my move past Brian and went to work. My first clear lap I was immediately in the 1:05s with a 1:05.6 lap time. I caught Coffey real quick and made my pass. The next clear lap I did another 1:05.6 to catch Kevin Pinkstaff. From there I got caught battling Kevin for the remainder of the race. I nearly clipped him at the checkers for 2nd, but didn't quite get the job done and I took 3rd. I wasn't disappointed at all. I got into the 5's and had barely 2 more tenths I needed to shave off to take the lap record. My plan worked out pretty well, but had room for improvement in the second race of the day, Open Supersport. I felt some pressure going into my final race Saturday. Unlike Formula Ultra, I had to put stock wheels on to be legal for Open Supersport. I finally got to run my OZ Racing lightweight wheels this weekend and they were a huge upgrade, allowing me to make direction changes easier. It's a huge help in turn 5/6 at PIR. Also, the weather wasn't as warm as it was earlier in the day, and conditions for Sunday weren't looking great. I felt this was the final chance to take the lap record down, so I had to make it count. When the green flag dropped, I did the same as I did in Formula Ultra, with one exception. I waited an extra lap before passing Brian Pinkstaff, giving myself a larger gap to close. I gave about a 5 second cushion between myself and the leaders. To be honest, I thought I messed up and gave up too much time. Once I passed Brian, I was full charge. I thought the lap record lap would be when I drafted passed him down the front straight and nailed my first lap ahead of him, but it was only a 1:05.6. I was a little flustered because I rode that lap so clean and hard. But I kept chipping away. Lap 4 was a 1:05.7. Lap 5 was a 1:05.6. I felt as if I plateaued. I developed quite the rhythm however, and was flowing around PIR with such speed and finesse. I persisted. Lap 6, 1:05.342, a new lap record. I read my lap timer as I crossed the finish line somewhat surprised. I felt I was going slower, but I wasn't. Perhaps I was just smoothing it out a little bit. I didn't know officially at the time if that was a fast enough 1:05.3 to beat Devon's 1:05.3, so I kept my focus and tried even harder for one more lap, just a little faster. Lap 7, 1:05.228! I did it! I knew this time I had done the deed. And at this point, that 5 second gap I was down was now less than a second. Lap 8 was a sigh of relief, and I backed off to a "mild" 1:05.8. Lap 9/10 I was battling Coffey and Sutton and settled for 3rd. It got pretty sketchy with all the lapped traffic. I just wanted to finish! As I rode back into the pits I could hardly contain myself, I was pretty happy and it felt really good to finally get that lap record back. As I mentioned, I got into a rhythm out in that race. How I would describe that rhythm is establishing a first lap that was fast, but clean. And every lap after that, I made fine adjustments as I tried to go faster and faster. It actually felt easy to be honest. Just like it did back in 2014 when I broke into the 1:05's the first time. The points in which I would pick up the throttle, and how fast I would pick up the throttle, to how far I trail braked into a corner and how gently I let off all added up to that little bit extra I needed to get the job done. There is a bump tipping into turn 7 I would hit and it would kick the rear tire into the air every lap I was in the 1:05's. Anytime I didn't get that kick into turn 7, launching the rear in the air for a split second followed by the rear-end wagging into the corner on landing, I knew I wasn't going fast enough. There's a couple other little things I discovered that I could keep an eye out for as I progressed through each lap to tell me if I was on pace or not for a low 1:05. I will say that I learned this OMRRA weekend that 1:04's are possible someday. I didn't understand how a lap faster than my previous best, a 1:05.7 (set in the same race in 2014 that McDonough broke the track record with a 1:05.3) could be done. But I learned how, and now I see the possibility to go even faster which is a good feeling. It takes a lot of variables to be right for a track record to be broken, however. It takes the right weather conditions, the right track conditions, a rider that's extremely focused and comfortable with his/her bike, it takes the perfect tire selection (my Dunlop ultra-soft slicks were on point! ), it takes a good bike setup and team, good competition, and it takes a strategy. There are a few more variables I may be missing, but it's surprisingly hard for those to all come together. I've been racing the same track for 4 years, and the last 2 on a bike that theoretically is better and faster than my old track record bike, yet for years I couldn't go faster until now. Anyway, we will see how long I can hang onto this record! Or how long until I can beat it again. The rest of the OMRRA weekend went alright. I had an electrical issue that didn't allow me to race Open Superbike on Sunday. I finished a close 2nd to Ryan Sutton in Formula Ultra after duking it out with him all race. Next Up: back on the dirt Super Hooligans down in Hanford, CA!